For over a decade, I’ve struggled with food and body image. At 8, I started worrying about how my body looked. At 10, I discovered Weight Watchers and my seemingly endless cycle of dieting started. Then, at 15, my eating disorder started. As a dancer, my world has always been full of mixed messages about bodies. Most of the dance world isn’t very accepting of varying body types, so many people actually encourage disordered behaviors. The “ballerina body” was often discussed, and attaining that body type was a goal for many. As I got serious about dance, I felt pressure to change my body. This pressure mixed with already feeling negative about my body, my perfectionist nature and family stress created the perfect storm for my eating disorder to take hold. I became obsessed with calorie restriction and clean eating; I was tracking every bite I consumed. As my body got smaller, people praised me for getting closer to the coveted “ballerina body.” This praise served as positive reinforcement for my eating disorder, and I continued spiraling deeper and deeper into self-hatred and destruction. As unhealthy thoughts took over my mind, fueling my body for the amount of dancing I was doing was no longer a priority. Most of the time, I was exhausted. I had no energy, and being lightheaded became commonplace. It never occurred to me that what I was doing was wrong or unhealthy, thanks to the positive comments from people I respected. The encouragement from those around me only served to strengthen the fire of my eating disorder. Four years later, at 19, I finally decided I was done living my life plagued by constant anxiety and feeling like my body was my enemy. Taking a brave leap, I started therapy, specificallyDialectical Behavior Therapy (DBT). DBT consists of four modules: mindfulness, emotion regulation, distress tolerance and interpersonal effectiveness. Each module consists of several skills, which help people cope in a healthier, more effective way. DBT focuses on balancing both acceptance and change. This therapy has allowed me to find constructive ways to manage the intense emotions that accompany my eating disorder and anxiety disorder, and turn to positive ways of coping. Another impactful change DBT gave me was focusing on being mindful while dancing. Mindfulness allows me to now find freedom and beauty in my movements, rather than focusing on my appearance in the mirror. Changing my perspective on dance and reevaluating what being a dancer means for me has allowed me to shift dance from something that once fueled my eating disorder to something that frees my soul. 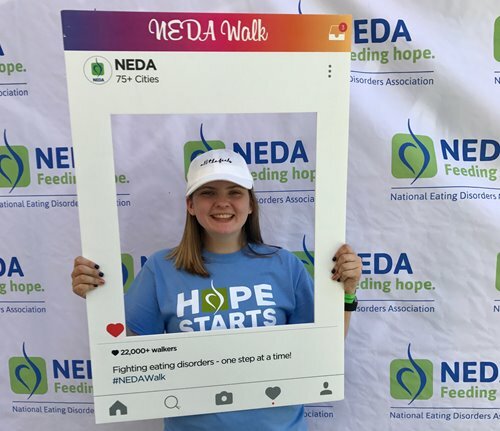 The help and support I’ve received from my therapist and others around me throughout my recovery has made me want to devote my life to helping others who also have eating disorders. Through my Instagram account, @leenahlovesherself, I share my story with over 12,000 strangers every day to raise awareness and provide support for those who are struggling. I’m also in college studying psychology, and I plan to attend graduate school for mental health counseling so I can become a therapist. My dream is to start an eating disorder treatment program specifically for dancers. Achieving this dream motivates me to continue working on my recovery. Recovery is hard and scary, and sometimes it can be a challenge to keep going, but in moments when I feel like giving up, I remind myself that the only way I can achieve my goal is by staying rooted in recovery—even when everything in me is telling me to quit. Even with the bad days, I am now thriving and living instead of just existing. I’m discovering who I really am, and I’m turning my pain and struggle into power and beauty. Through dance, DBT and my dreams for a better future, I’m conquering my eating disorder one day at a time.